Avoid lifting over head & shoulders. Avoid low lifts, especially off the ground. Stay mentally alert, (morning, lunch & end of shift). Get help moving or lifting bulky objects. 35 lb. 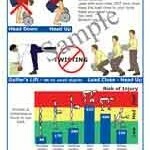 begins high risk for back injury with repetitive lifting for females. 50 lb. 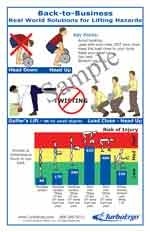 begins high risk for back injury with repetitive lifting for males. When lifting any object, assess its size and weight first, establish a firm footing, prepare for the lift, bend at the back only slightly, bend at the knees, keep the load as close to the body as possible, avoid any turning or twisting with the lift, lift with the legs, keep the stomach muscles tight, and lift with a slow and smooth movement. Materials stored at least 20 inches off the ground reduced strain of the back by 50%. Use handling aids such as dollies and lift hoists for heavy items. With a load (carrying) avoid twisting the trunk of the body. Avoid reaching the over 16 inches with any job activity, especially lifting. Avoid prolonged bending or long periods of standing. Take breaks from sitting every 15 minutes. Pushing is better than pulling. Adjust just your work surface height to avoid bending. Make sure your work space is adequate. Remember that injury occurs lowering objects as well as lifting. 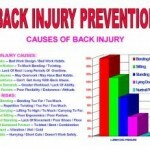 Reduce frequency of repetitive action of any body part. 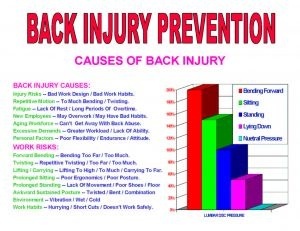 *Avoid sitting with an unsupported back if possible (no slump). Make sure you warm up before any physical activity, no matter how insignificant that might seem.